Okay – It’s cold, the sky is grey, and a lot of us are sitting at home, thanking heaven for central heating and wishing that new episodes of Black Sails were still coming out. Never fear. Today I present to you a TV show that folks in the US have probably never seen. It’s available on Amazon Prime right now, and DVD’s of the series are available for less than $10. 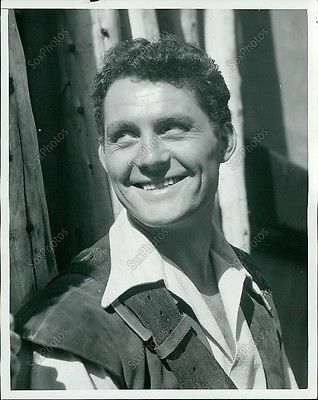 I’m talking about the 1956 British series The Buccaneers, a children’s show starring Robert Shaw (who also played Quint in Jaws.) And before you say “kid’s series,” and flee, this is not quite “Jake and the Neverland Pirates.” Remember Dr. Who, which also started out as a kid’s series at about the same time. It turned out ok. The year is 1720. Though Shaw was supposed to be the star, he was not available for shooting when the first two episodes were produced. At first the series seems to be about a real person, Woods Rogers, as he shows up to take over the position of Governor to the island of Nassau in the Bahamas. Given the fact that Rogers is supposed to be a good guy in the 1950’s mold (kind, wise, and good-looking) the transfer of power goes off in a surprisingly historical fashion. 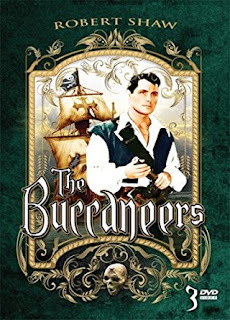 The island is in chaos, but Roger’s offer of pardons brings most of the pirates to heel. Woods Rodgers didn't actually look like this. We get a good, quick look at Ben Hornigold, Jack Rackham, Charles Vane and Blackbeard, and all behave in a way that’s fairly close to history. It’s important to note that someone seemed to want to use this show to teach British history to children, so a high percentage of the details are right. I also think that the time period of the show – 1956, when service men who had served in WWII were still settling down after the war. After all, the arrival of Rogers in the islands signaled a “taming” of pirates, just as the people of the 1940’s and early 50’s were expected to turn their backs on the wild lives they had lived before. 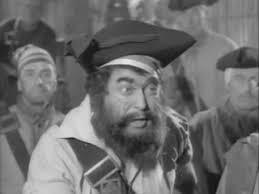 It’s the third episode before Shaw, in the form of pirate captain Dan Tempest. Too late to accept the pardon, Tempest is arrested for piracy, and then given a chance to redeem himself by captaining a trade ship to Jamaica. He encounters Blackbeard along the way, wins and engagement, and somewhat redeems himself. Tempest considers still considers himself a pirate. Now, remember that these are half-hour episodes, created in black-and-white half a century ago. But by this time I was already seeing things about this series that I really liked. Little things like the fact that some of the ships have tillers instead of wheels for steering. (The early 1700s were a period of transitions between the two.) Also, some of the pirates wear their 3-cornered hats with a flat side in the front instead of a point, which is also historically accurate. When the sailors move heavy objects, such as cannons, they use correct the correct knots in the ropes. Little things like this go a long way with me. 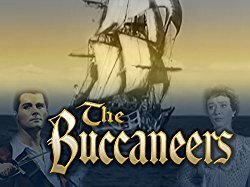 Simply put, this early TV series is not tied down to decades of cinematic pirate lore, so different from actual history. The series had the use of a real ship, and made good use of it, showing some actual sailing, with correct orders being given, and the actions of sails, line and anchors makes sense. Britain has always been a sailing nation, and put at least as much concern into historic ships as America does into cowboy epics. In addition, in 1956 some sailing ships were still hauling cargo professionally. As the show went on, I saw issues being dealt with that you don’t see in modern movies. Slavery, for instance. Dan Tempest doesn’t like slavery, but the practice was perfectly legal during his time. When he encounters a ship full of rebellious slaves (both Black and White, it should be noted), what does he do about it? Other episodes deal with shortages of gunpowder, diseases such as typhus, relations with Native Americans, the scarcity of women, and issues with the legal rights of indentured servants. And most of the classic “Pirate’s Articles” are repeated by a group that’s going out “on the account.” Including, “Lights out by 8:00” and, “no drinking below decks.” Someone did quite a bit of homework. And throughout all of this is Dan Tempest. 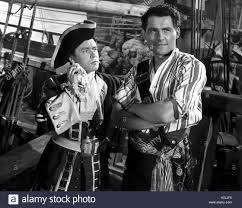 Robert Shaw plays a pirate as I have always liked my pirates to be played. He moves and speaks and acts as if life may be over at any moment, and he needs to wring all the pleasure possible out of it right now. He drinks, fights, and talks back to authority figures with an enthusiastic pirate spirit. This is the first time Shaw sang “Farewell Spanish Ladies” on screen, and also the show that taught him to fight with a sword. Early episodes try to make him into a farmer in the island’s interior, but he quickly finds his way back onto the high seas. Early episodes also ty to tie him down to a wife and family. (See above: the taming of the pirates.) But, whether because the show wasn’t doing as well as the sponsors would have liked, or because whoever wanted the moralizing tone worked into the program let their attention wander to some other project, Dan Tempest does not settle down as expected. The fiery Spanish tavern-singer who has been the love of his life runs off the Jamaica, leaving only a note saying, “I don’t cook, I don’t clean!” Dan himself does not seem to be too honest. If bags of gold aren’t being watched, he’s perfectly willing to pocket them. Even when he’s trying to “go straight” he practices some sharp trading. 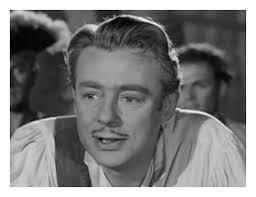 He’s also willing to kiss a lady or two, even if she’s being courted by someone else. The Buccaneers makes good use of its budget for sets, but this is no Black Sails. Some of the fight scenes are laughable, with actors obviously pulling punches and missing hits. A few of the episodes are obviously padded out, with lots of shouting about the same thing over and over instead of character development. But all-in-all it’s a very pleasant surprise. I’m watching it one episode a day, to make it last. wow, cool! thanks for finding this! Yay, now I have more pirate stuff to watch. I myself have a fondness for mid-century tv. This looks like a good watch, thank you for pointing it out. On another note, I didn't see a contact button on your blog, so I will mention it here: The History Blog (always a fun read) made a post this week about book pages uncovered from the Queen Anne's Revenge! They've finally decoded what it's from. Anyway, thought that this news might be at home on this blog, so I thought I'd share.